Draft horse breast plate, choose from our many stamping designs shown on our website. This draft horse breast collar is shown in brown with black accents and stainless steel hardware. Size on this breast plate is a little larger than our standard breast plate. 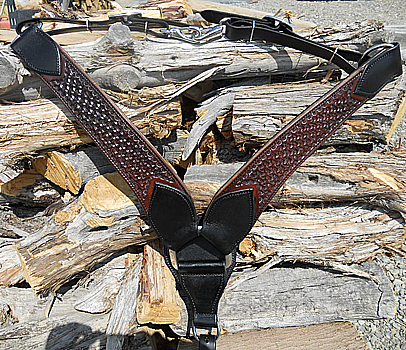 This breast collar was custom made to match a Friesian Draft Horse saddle. Click here to see the entire matching set!